Ian Maxwell, an information technology major at Georgia Southern University, only knew about local government operations as it was portrayed on television shows such as Parks and Recreation. However, through his internship with the Camden County IT Department, Maxwell received first hand knowledge not only about the inner workings of various county departments but also what an average day working for the Board of Commissioners entails. Maxwell’s main tasks were to create an accurate inventory of all county hardware and software, complete and audit of these assets, and create an Inventory Audit Instructional Guide for future reference that county employees can utilize. Prior to this internship, he had never been assigned a task of this magnitude in a work environment. Maxwell noted that being able to complete the task to the satisfaction of his supervisors was a very rewarding experience and showed him that hard work really does pay off. 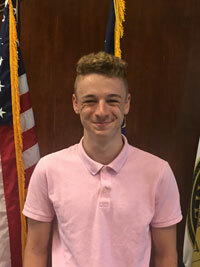 In addition to the tasks assigned, Maxwell noted that he also really enjoyed working with and getting to know county staff.Not only did they make him feel right at home from the first day of his internship, but they were also very helpful and supportive when he experienced a setback. He was further encouraged by the positive interactions and relationships he was able to build with staff for which he did not work directly. These interactions helped Maxwell sharpen his networking abilities which he previously had no experience in prior to the internship. Aside from sharpening his networking skills, Maxwell was further able to strengthen his IT skills, including fundamental concepts which will give him an advantage in his continued studies in school. These skills included learning more about IP addresses, understanding firewalls, switches, virtual servers, and even the differences between computer models. Maxwell does not have definitive plans about what he wants to do after graduating, but due to his experience and conversations with Camden County officials, he indicated that he would love the opportunity to work in county government.